It was a night of glitz and glamour as the superstars of the industry gathered at the Airtel Superstars Award conducted by Star. Our stars gathered to honour what is said to be the most authentic publicly voted award show. See who we thought added to the glamour of the night and who so did not! 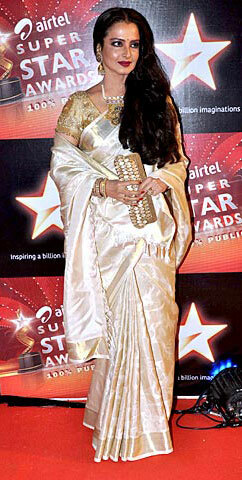 Rekha-ji stuck to her usual uniform style of an elegant silk saree. There’s really not much to say except that the woman is grace personified! The accessory that always ensures that her look is a winning one, her confidence! 16 queries in 0.799 seconds.